There are more than 30 different blood groups associated with the human species; understanding the defining genetics of each has been of fundamental importance to medical and healthcare research. Whether it’s assessing the compatibility of a blood donor for a particular transfusion, or testing for conditions such as Down’s syndrome in unborn babies, the practical application of that understanding is felt on a daily basis in hospitals across the country. For Neil Avent, Professor of Transfusion Medicine and Molecular diagnostics, it’s the very life-blood of his research and has been for more than 25 years. From foundational work on the Rhesus system, one of the most complex and important blood groups, to the development of clinical methods around non-invasive prenatal diagnoses, it’s research that has spanned the ‘bench to bedside’ spectrum. Neil’s early-year research involved developing methods to prenatally define Rhesus D (RhD) status in the clinical management of HDFN (Haemolytic Disease of the Fetus and Newborn). This is the condition where the mother’s immune system attacks the fetus if they are of opposite Rhesus types (positive or negative), and the mother has previously been exposed to RhD positive blood and has developed an immune response to it. 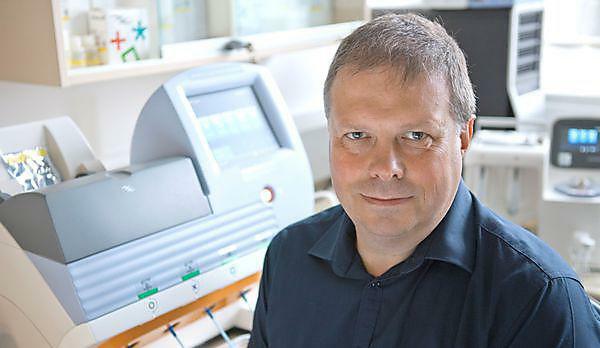 The work contributed directly to the development of non-invasive methods to test for RhD, and the first clinical service in 2001, and was then extended with European funding through the Special Non-invasive Fetal and Neonatal Evaluation, of which Neil was chair. At Plymouth, Neil and his team work closely with the NHS in the South West, and focus upon two major strands: non-invasive prenatal testing/diagnosis (NIPD) and blood group genotyping. Using an array of sophisticated equipment, including a mass spectrometer called Orbitrap Velos, a digital polymerase chain reaction (PCR) machine BioRad QX100, and a genome sequencer called Ion Torrent, the team has the ability to conduct a wide array of molecular and genetic experiments. In the field of NIPD, the work has sought to improve prenatal diagnoses of several conditions, reducing the need for invasive procedures such as the amniocentesis, which has a miscarriage rate of 1 per cent and can increase the risk of RhD Haemolytic disease of the fetus and newborn. What may be even more ground-breaking is a potential breakthrough in Down’s testing emanating from the field of proteomics. Thanks to their work with Orbitrap, and research undertaken with collaborators in London, the team believe they may have identified a ‘protein marker’ related to Down’s. If proven correct, it could ultimately lead to the production of a fully diagnostic test, and one which would be much cheaper to administer than current DNA-based ones. The work surrounding blood group genotyping has been no less significant, with the legacy of Neil’s 15-year involvement evidenced by the commercial product BLOODChip. Used to manage those patients who depend upon blood transfusions to live – such as those with sickle cell disease – BLOODchip’s ability to establish the genetic basis of donor samples helps them to match to those in need of transfusion, thus reducing the risk of complications. Neil has continued to lead on blood grouping methodology, working with Sanquin in Amsterdam to develop a new technique known as multiplex ligation dependent probe amplification (MLPA) which can analyse thousands of regions of the genome at once, like a molecular abacus, counting chromosomes and identifying irregularities. He’s also at the forefront of research on next generation sequencing (NGS), which is expected to replace MLPA and PCR methods for blood group genotyping in the near-future, and could pave the way for all blood donors to be genotyped. “It’s all about getting ahead of the game; it’s looking at new technologies and applying them so that we can move forward to a more personalised form of healthcare and medicine,” Neil added.